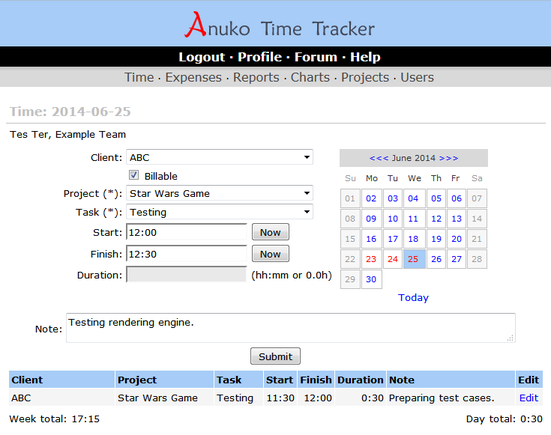 Anuko Time Tracker is an open source, free, web-based work time tracking system, written in PHP. It is simple and very easy to use. It allows you to create user logins and organize them in teams, create and modify projects and tasks, input work time, generate reports and invoices and send them via e-mail. The application runs on Unixes, Windows, and Macs. It has three time tracking modes: time only, time by project, and time by project and task. The following plugins allow for extended functionality: charts - for visual diagrams of the time spent on projects and tasks, clients - for allocating time to clients, invoices - for invoicing clients, custom fields - for an additional text or a dropdown custom field to include with each time entry, expenses - to track expense items in addition to work hours. Free hosting of this service is available at https://timetracker.anuko.com in many languages.